As many treasury and finance professionals will attest, organizing covenants by the legal categories of affirmative, negative, financial and nonfinancial is not very helpful. A better approach is to classify covenants by lender objective and risk. Using lender objectives is effective because nearly every covenant can be easily classified into nine logical lender objectives. Doing so facilitates the accurate comparisons needed to eliminate repetitive covenants in the same agreement and determine the controlling covenants of multiple debt agreements. Lenders tell borrowers which covenants are most important to them by stipulating 0-3 day cure periods. The “independent covenants” that are triggered by events and actions outside the agreement should have the initial risk focus rather than the “dependent covenants” that are triggered by the agreement’s independent covenants. Finally, it is relatively easy to winnow out the common boilerplate and “lender option” covenants. The latter are actions or payment demands initiated by the lender that the borrower must allow or pay. The foundation of an effective and efficient debt compliance program is a comprehensive and prioritized covenant checklist. Developing one is a difficult, time-consuming task because it is much more than summarizing the affirmative and negative covenants sections of a debt agreement. Depending upon credit risk, a senior credit agreement will have 80 to 100+ covenants, with 35 percent to 50 percent of them scattered throughout the agreement outside these two sections. The foundation of an efective debt compliance program is a comprehensive and prioritized covenant checklist—but that’s easier said than done. Lenders have two objectives: preserve the status quo at debt issuance (e.g., existing credit conditions, security and operations) and to be quickly informed of any adverse changes to the status quo so they can re-evaluate the credit risk, agreement terms and pricing. legal categories of affrmative, negative, financial and nonfinancial. In general, lenders have two objectives. The first is to preserve the status quo at debt issuance: the existing credit conditions, security and operations. The second is to be quickly informed of any adverse changes to the status quo so they can re-evaluate the credit risk, the agreement terms, and the pricing. More specifically, lenders use covenants to maintain their collateral and security interests; to preserve the borrower’s assets and business operations; and to minimize third party claims, while allowing some limited claims. See Figure 1. In addition, lenders also require borrowers to make payments; to meet performance benchmarks; to regularly report results; to report material events quickly after they occur; and to give themselves the option of doing certain actions or demanding additional payments. See Figure 2. Lenders aggregate the covenants into events of default categories that have different cure periods based upon the importance the lenders attach to their compliance. The chart below summarizes how this is typically done for senior credit agreements. See Figure 3. Covenant violations related to the reps and invalid security and collateral agreements are among the lenders’ most serious covenant violations. Yet, in our experience, the reps and the security and collateral covenants (and any related security and collateral agreement) rarely receive more than cursory treatment in most debt compliance programs. While companies do make every effort to provide accurate reports to their lenders, few are aware that that an inaccurate report can be an immediate event of default. Lenders will add other events of default that do not appear elsewhere in the agreement. They are standalone covenants that must be included in the covenant checklist. 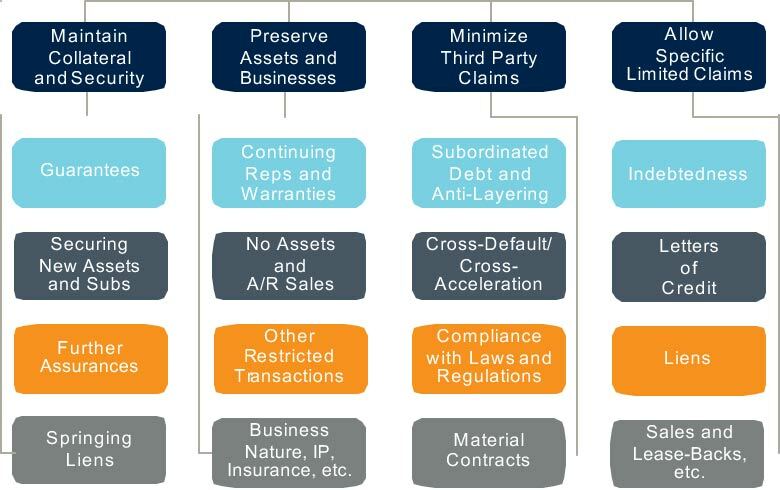 A risk-based debt compliance program focuses on the real, manageable risks by excluding the dependent covenants, any not applicable boilerplate covenants, and the lender option covenants. Independent covenants are triggered by events or actions outside the agreement, while dependent covenants are any required actions following a triggering of an independent covenant. A notice of an asset sale is an independent covenant. The subsequent covenants requiring the proceeds to be reinvested in similar assets within a certain period of time or used to prepay the debt are dependent covenants. Many notice requirements will have dependent covenants, especially in covenant-lite deals. The latter will often dependent incurrence covenants, requiring the pro forma calculation of financial ratios against fixed limits. The dependent covenants are not relevant if their independent covenant has not been triggered. While independent covenants represent the initial risk, dependent covenants also pose a significant risk because they are often forgotten. Always when a covenant issue arises, the compliance team must read the applicable debt agreement text to ensure that all requirements are or will be satisfied. Provided that there is such a commitment, then the dependent covenants do not need to be monitored in the quarterly compliance process. Compliance with the Foreign Corrupt Practices Act, the Patriot Act, etc. Federal Reserve Board Regulation U on margin stock. It is unnecessary to include the first two in the debt compliance program if they are covered by the company’s other compliance programs. If the company has no defined benefit plans, the ERISA covenants are simply not applicable. Similarly, there’s no chance that any nonfinancial company will suddenly become an investment company or start providing stock margin loans to its customers. Banks include these two because they are related to restrictions imposed by their regulators. Lender option covenants give the lender the right to request certain information at any time or demand additional payments based upon changed circumstances independent of the borrower. These covenants include the right to visit the borrower, inspect or audit the books, and have discussions with management. They also include additional payments due to changes in law or reserve requirements that increase the lender’s borrowing costs. Since these covenants are initiated by the lender and are not triggered by borrower actions, they are not compliance risks that can be managed. Of course, they need to be complied with when they are initiated by the lender. For debt compliance purposes, by excluding the above covenants, we are left with a risk-based list of relevant, controlling covenants organized by logical lender objectives. Further risk analysis can be done, excluding the unlikely covenants from the moderate to high risk covenants, provided that the covenants deemed unlikely are periodically reviewed. From this carefully vetted list, we can confidently develop a multi-agreement quarterly questionnaire process to document the compliance, a consolidated permitted baskets analysis, and a consolidated calendar of the regularly scheduled payment and document delivery due dates. The covenant questionnaires, organized by objective and subject provide a useful context to non-treasury/legal staff for why these covenants are important and why they need to be responsible for their compliance. This checklist process identifies the covenants that need to be regularly monitored without cluttering the debt compliance program with covenants that are initially not or really not relevant. However, in debt compliance the only authority is the debt agreements, not the checklist. Just like a map is not the territory. So, whenever a covenant issue is raised, it is the compliance team’s responsibility to research the applicable covenant text and make sure that the company is in compliance with all of the covenant’s requirements, including any dependent covenants.